As it turns out, according to a new "study," hospitals can greatly improve their flu vaccination rate among health care workers by using a mandatory employee vaccination policy. This is according to a Henry Ford Health System study, funded by Henry Ford Health System and citing the "data" from Henry Ford Health System. The upper echelon of Henry Ford, acting under their created task force, is attempting to pass off a "duh!" observation of authorities using power over subordinates as a true-blue health study. Yet, nowhere in the study is there any proof of reduction of disease or an increase in employee/patient health and safety. The achievement lies in complete subjugation - a foregone conclusion when employers threaten career destruction, i.e.,"Inject this into your body every year, or no more food on the table - and no good reference for you!" Henry Ford "researchers" say the health system achieved employee vaccination rates of 99 percent in the first two years of its mandatory policy, in which annual vaccination compliance is a condition of employment. No...really? Allison Weinmann, M.D., a Henry Ford Hospital Infectious Diseases physician and study co-author, says it was only after the health system went to the mandatory policy for the 2012-13 flu season did the vaccination rate substantially improve. Ongoing employee communication and having available vaccines were also key factors, Dr. Weinmann says. Let's get real: communication = order, similar to forced smoking cessation programs where communication equals emails and posters stating the deadline for employees to quit. The real "key factor" here is job security. The study is being presented Saturday at the 54th Interscience Conference on Antimicrobial Agents and Chemotherapy in Washington D.C. Does this mean it will go on to influence wider-scale hospital policy? As expected we got push-back from employees. But we always believed it was the right thing to do for patient and employee safety. Noteworthy phrase: "We believe..." and how proactive in vaccinating patients? More than 9,600 people were hospitalized for the flu during the 2013-14 flu season, and 60 percent of them were between the ages 18-64, the CDC says - and recommends vaccination for anyone six months and older. Henry Ford used to require voluntary vaccination among employees. Between 2005 and 2010, its vaccination rate hovered between 41 percent and 55 percent, though the health system's goal was always 100 percent immunization. For those who originally balked at "slippery slope" arguments about the slide into mandatory vaccines to guarantee employment, here's how it happened in this particular case. An opt-out measure allows employees to decline vaccination for a medical or religious reason. These employees must complete a declination form, which requires their physician or religious leader to state the reason for forgoing vaccination and to sign their name. Are we to assume that they then are forced to wear a mask? Our success is attributed to three factors: Our commitment to patient and employee safety, aggressive employee communication and education and making sure we have enough vaccine to accommodate everyone. We couldn't have made the strides we did without all three working together. A big hurdle was addressing the myths associated with the vaccine itself and reassuring employees this was all safety driven. The mask "opt-out" is nothing more than a scarlet letter - a ritual of humiliation that exhibits fear to patients. If the vaccinated employees are asymptomatic carriers of disease through the throat - they actually pose the greatest risk to patients. Why does hospital administration not take employee concerns seriously? Many of whom are doctors and nurses. 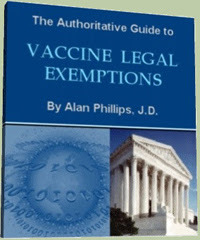 I highly recommend you read Vaccination Voodoo: What YOU Don't Know About Vaccines, especially for the mechanism of ingredients, lesser-known nuances and how flu vaccine strains are chosen. You can also see this lecture to see why flu vaccines are ineffective and unsafe, as well as information about mandatory vaccines already on the law books, waiting in the wings for potentially all Americans during a "state of emergency." Arnold Hoekstra, the first Canadian healthcare worker fired for vaccine refusal explains why employees don't want to wear masks for four months out of the year, besides the obvious reasons -here and here. While he says here, that he can find another job in Canada, the same cannot be said for healthcare workers in the United States. From the report above, and Hoekstra's experience, it is apparent that the corporatization and privatization of hospitals has something to do with getting away with the use of force and trampling employees' rights. Don't be fooled by the "not-for-profit" status. In both cases, policies were dictated and carried out by a board of trustees. As you can see, it is increasingly more difficult to stand up for rights and principles in the face of impoverishment. The fact that this egregious propaganda and fear-based exercise in subjugation gets to parade in Washington as a successful health campaign is a syringe-shaped middle finger - not only to human rights, but the rights of employees to carry out their jobs without sacrificing their conscience and their bodies to psychological bullying.